Angel Number 1122... What Is The Message From Your Angels? What's The Meaning of the Angel Number 1122? In angel number terms, seeing 1122 is a powerful combination. 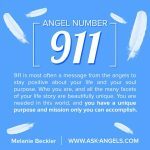 The Angel Number 1122 carries the energetic blueprint of your highest spiritual path and your authentic purpose. So when you see 1122 your angels are communicating with you the importance of aligning with your authentic soul purpose. They’re also reminding you that they’re here to help you with this process. 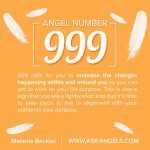 Learn more about how and why angels communicate through numbers here. To more deeply understand the meaning of 1122, let’s look at the meaning of both 11, and 22 first. The Angel Number 11 is a number of awakening and enlightenment. 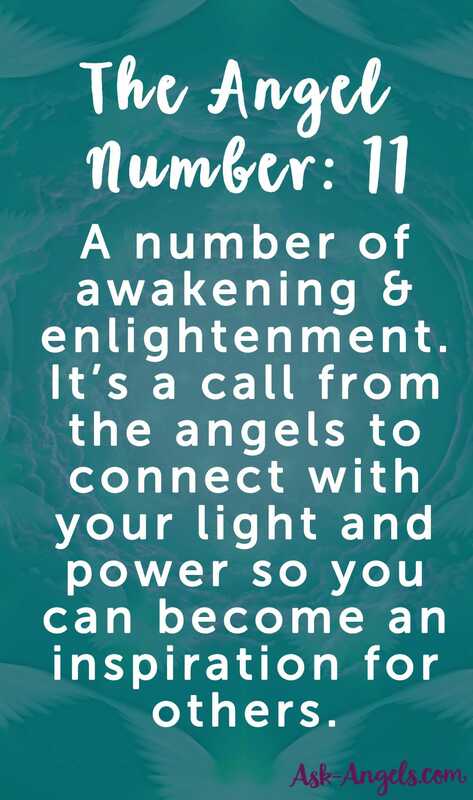 Seeing 11 is a call from the angels to connect with your light and power so you can become an inspiration for others. It’s a reminder that you are a beautifully unique spiritual being and that aligning with this authentic truth will help you achieve a sense of fulfillment, joy, love and purpose in your life. 11 also brings the message to positively align your thoughts with your intentions, and desires rather than fears. What you think about and what you believe plays a key role in what you accomplish in terms of your soul purpose, and it plays a role in what manifests as experiences in your life. Positively aligning your thoughts and intentions will help you to achieve your soul purpose, and create positive blessings in your life and in the world. The meaning of the Angel Number 22 is about building your dreams and manifesting your desires. 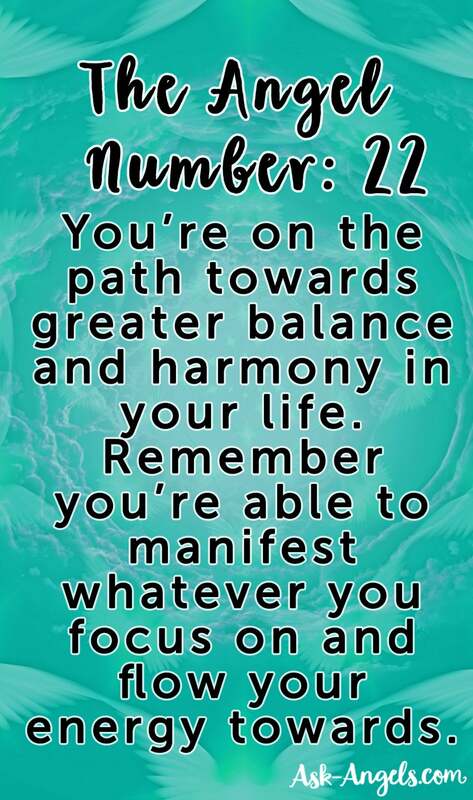 22 speaks to being on your path towards achieving greater balance and harmony in your life, and its presence reminds you that you’re able to manifest whatever you focus on and flow your energy towards. It also reminds you to listen to your intuition and to follow your heart, both of which will guide you in the direction of your life purpose and your highest possible path. The number 22 invites you to focus upon and dive whole heartedly into building your dream and working on your life purpose. It represents your ability to now create and manifest blessings in a masterful way. When 11 and 22 combine, their meaning takes on the characteristics of both 11 and 22. When you see 1122 your angels are both reminding you that it’s time to focus on your highest life purpose, and that you have the energy, skill, and guidance needed to manifest this your higher calling now. 1122 brings the message that you have a tremendous opportunity right here and now to discover and manifest greater purpose in your life. It’s the perfect time to move on from the past and create a new beginning that is in greater alignment with your authentic truth. Follow your heart and your inspiration and keep your thoughts and energy in alignment with what you want to create. 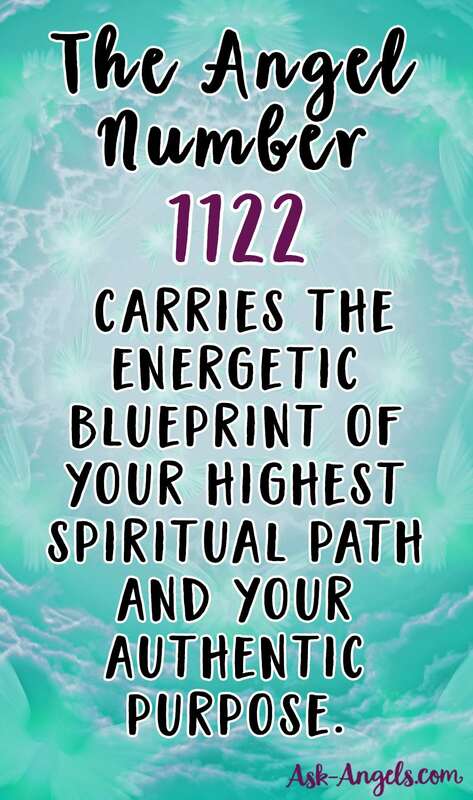 The angel number 1122 indicates a time of inspiration … When you act on these inspirations they will guide you towards manifesting your desires. 1122 signifies that it’s time to play bigger in your life, it’s time to really get to work on your highest purpose, knowing that this “work” is what will bring you greater joy, fulfillment, and purpose.. While also making a difference in the world. Start taking inspired action, and know that your angels are supporting you each step along the path. Ask for help, trust the guidance you receive and take action! Anything is possible now, and when you open your heart and look at your current situation it’s highly likely that you will be able to see evidence that your dreams, and a deeper, more powerful level of your highest soul purpose is already beginning to sprout. Stay positive, and keep taking steps that are in alignment with love and your inner inspirations. And a reminder that you are guided, supported and immensely loved now as you take steps along your path of awakening. Do you have 11 or 22 in your Personal Numerology Chart? Find Out With A Free Numerology Reading Here! Angel Number 999. What Does It Mean? Last night at around 9ish i was awoken by an emergency services phone call. There was a man on the phone talking and i went to hang up when he was saying “If you can’t speak right now…”. I saw the phone call was directed to 1122 and when i googled it as an emerency number it was a pakistani emergency number. And the man speaking wasn’t pakistani. However, the first time i googled it i saw “angel number” so i went straight back to that after a few searches for anything emergency related, and i found this. I definately didn’t type the 1122 into my emergency call area on my phone but, maybe my phone glitched because i drop it every now and then. Yesterday i was in the woods and i went through this den thingy for maybe my second or third time, and i found this nice small peice of beautiful woodland area which was quite hard to get to. I kept on having this weird thought that i went through a portal to hell but i think that was me being to imaginative. After leaving the area i went on this little trail and that was that. A few months ago i used to to go in the woods with my dog who i always take and he used to stare at me a lot when i was planning on going through this particular path. Sometimes i used to think he was looking behind me, i don’t know. One of the first times i went in the woods i found a square peice of wood in this big open area which was quite hard to get to and inside it was some clay and insects and i kinda think like i did that day that someone was hiding something. On that same day i found some ripped up peices of clothes which were very easy to get to because they were near this picnic table which was next to the path. They were in this little brook. I felt like they were children’s clothes or maybe thats just me thinking that because they were cut up so small. Not all the cut up peices of clothes were there as there was only maybe 3 or 4 peices. One of them was a zip which i took home to see if i could find anything on the internet from the company which made the zip. On the path my dog used to stare at me i always felt like i was being watched. I don’t know why, maybe its because im a scary movie fanatic but idk. Yesterday i was also watching a load of scary movie trailers and reactions to scary stuff and on the ouiji movie trailer someone commented that watching the movie or playing ouiji can lead to demons coming into my life. So…. theres my peice. I have never been religious but more spiritual but never really done anything on it. Are my angels telling me something or is it just a lot of coincedneces and a phone glitch. Do I see this only when I met my twin flame or no? Not necessarily… There are always layers of potential meaning. I had a spiritual awakening on September 10th at 11:22pm. It was not a coincidence that I chose to google “What is the meaning of 11:22?” It was not a coincidence that I chose ask-angels.com of the many websites at that time. It was not a coincidence that I saw The Bible advertisement at that time. I’m really thankful to Melanie Beckler. Hi Melanie, i have started following your website and writing. I come across lots of special nimbers, mirror numbers, special numbers in time / car number etc. As you have mentioned that guardian angel is trying to connect with me and wanted to communicate with me. Please help me know how would I come to know what they want to communicate with me and how can I connect back. Looking forward to hear from you on the same. Hi Melanie, I keep seeing 11 and 22 all the time,mostly the 22. I was born on the 2nd and my sister on the 22 and. What do you think this means please? Everytime the clock is 11:22 I see the time or I see these numbers else where throughout the day. I got married on 11/22 as well. What does this mean? I am still quite comfused. Hey Brandon… Great question. For me this usually means I’m not quite in alignment… Close, but not quite. Maybe thinking too much, or focused on something that’s not really my highest path and light. I would recommend pausing, and entering inward to reconnect with your inner heart light to get back into sync. Hope this helps. My birthday is 11/22/77. Any particular meaning or thoughts on this. im raja from india..very nice article i feel gratitude.one no. always followed my life is 13.once in a while i have to create a password like the combination 8 (my marriage date),13(my birthday),31(my district no) as 81331. ..and after some days i needed to take photo and what was amazing thing happened was the ref no. (auto generated) was exactly like the mirror image of above password as 31138…im not seeing this as mere sync.. pls guide me how can i intrepret this for my life? This month I’ve experienced 11:11 synchronicity a lot of times. I’ve even experienced 22:22 synchronicity! However today I’ve experienced 11:11 synchronicity three times (so far at the time of writing, the day is far from over) and 11:22 synchronicity!!! What could all this mean???!!! I see alot of numbers They begin to. be more in my path since i lost my job 5 years ago. I was fighting injustice ,in my work place , nonhuman environment for workers and care givers . I did lost my job but i fought back harder. It made a difference. Now i just begin a new Supervisor profession and i am seeing lost of 333, 1111, 1122, 444,222, 1717 , they appears like anytime and i am reading the meaning but still don’t know why or what i am going to do. The only thing that happened is that i received like inside my mind You don’t know yet who you are and i see myself in dreams having wings , fighting and protecting others . It’s crazy saying that that way but its so strong and it’s keep going on this year too. I want to be a manager but need to go back to school they said. My experiences are not enough they say. Really!!! Don’t have millions to put in !! Before I met my “Twin Flame” I would notice the times “1221” constantly. It interested me to why, and then she had came. It was 2 years we had connected, until she fell in love with someone else. What I know love to be, I wanted that for her even if it wasn’t with me. Its been 7 months since she left, an now I’ve been seeing “1122”. I wonder what it could be, but i will take my ideas an inspiration that my angels have been trying to nudge me towards to help me deal with the sadness of losing what i totally felt was my true love. The time of my birth was 11:22. Does that have a significant meaning? Thank you so much for your message today, as it only confimed that Angel’s where with me today, guiding me and filling me happiness..